Our parish had a Lenten Faith Festival on Saturday, and the day was dedicated to the various Lay orders that are present in our parish. Each group had a representative speak about the order, plus there were tables set up with information from each group where people could sign up for more information. I gave the talk for the Dominicans, which is at this time a pro-chapter. We’re just getting started, and are still tied to our main chapter in Charlottesville, St. Thomas Aquinas. But we prayed and voted on a patron for our chapter, and Blessed Pier Giorgio Frassati is who was eventually named our patron (by unanimous vote!). That story in itself is pretty interesting, but I’ll save it for another time. I wanted to share my post on the Dominican Laity here. I finished the talk with my own story, which I only outlined in my notes. To make up for that, the link is included where I would have written more about it. Jane Aza, wife of nobleman Felix de Guzman, had the strangest dream about being the mother of a little dog with a torch in his mouth. The dog ran about, lighting the world aflame with his little fire. In 1170, Jane gave birth to a boy who was baptized Dominic de Guzman. Dominic had two brothers who went into the priesthood, and at 14, Dominic entered the Cathedral School of Palencia where he studied liberal arts and theology for ten years. During this time, he loved studying Scripture so much that he memorized great portions of it. While still at school, he was so moved with pity for the many poor people he encountered that he sold his own books in order to help feed and clothe them. We think nothing of this, but at the time, there was no printing press and each book was hand-written. Especially important books were written on vellum, which is made from animal skins. It would take 9,000 sheep to make a Bible with vellum pages. So, yes, at that time the Catholic Church would chain them down in the parishes. Dominic’s bishop, Diego Acebo of Osma, took notice of him about this time and invited Dominic to come to the Cathedral to be a canon priest there. His education continued there, as well, and the two eventually were sent to southern France by the pope to help counter the Albigensian heresy. One reason this heresy, which denied the goodness of the physical world among other errors, took such a firm hold there was because some clergy lived in luxury while the common people were living in poverty. The leaders of the Albigensians led lives of austerity, and so Dominic and his bishop realized that it was important that they, too, take on such lives. The Apostles had little, and so would they. They sent away their entourage and lived like beggars, preaching about the Church and her teachings. Dominic was so successful that he sought to make this his new mission, and he founded the Order of Preachers. This order would have four foundational ideals – four pillars – that would support its members: prayer, study, community, and apostolate (or mission). Prayer: The first pillar is prayer, and Dominicans pray in a variety of ways. Aside from the Mass, one of the most important prayers we have is one that Our Lady gave to Saint Dominic in a vision: the Rosary. Dominicans make a promise to attend daily Mass as often as possible and to pray a Rosary each day. We also pray both morning and evening prayer (Lauds and Vespers). Our prayer is a way to remain close to God and to contemplate His goodness. The Divine Office (morning and evening prayer) is the same for the whole Church, and it gives us a chance to meditate on the Psalms and how these ancient prayers apply to our lives. Our Chapter meetings always have the Rosary and Divine Office, and we try to make sure the Holy Mass is also a part of it, since the Mass is the highest form of prayer available to Catholics. Without prayer, nothing else we want to do would be possible. Study: When St. Dominic began his order, the typical parish priest did not have the education our priests get today. He made the decision that understanding the Faith was vital to helping others come to know The Lord and His Church. And so, study is an integral part of the Dominican order at every level. St. Peter wrote in his first letter “Should anyone ask you the reason for this hope of yours, be ever ready to reply, but speak gently and respectfully.” This admonition of our first pope is taken very seriously by Dominicans. We believe strongly in not just contemplating the Faith, but also being ready and able to explain it to anyone we encounter. There is an ongoing formation for all Dominicans, starting with the Inquiry period and extending for the rest of our lives. With 2000 years of Church history and theology to unpack, it’s unlikely anyone will ever finish studying it all in this lifetime. Community: We pray, we study, and we do these things in community. Our chapters meet about once a month, and our time together is an opportunity for us to share with each other. We don’t just share what we’ve learned, but we share each other’s burdens through prayer and fellowship. It’s a powerful thing to know that there’s a kind of second family who is ready to pray for you and help you when you need it. Anyone who’s studied in a group knows that it helps everyone to hear other people’s viewpoints on what you’re trying to learn. Another person’s insights can help deepen our own. Apostolate/Mission: It does no good to study and pray and learn from each other unless we do something with it! And so the Dominican’s apostolate is to preach and teach about the Faith. Obviously, this looks different for each person, depending on his or her state of life. My apostolate of preaching looks very different from Fr. Scordo’s apostolate, and it’s not even the same as John and Tresa’s apostolates. For the Lay Dominican who is also a parent of school-aged children, sometimes that apostolate looks a lot like teaching your own children about the Catholic Faith. Maybe someone has a talent for writing and uses an online blog to reach out to people and start sharing the fruits of study and contemplation there. Some Dominicans teach Sunday School (just ask the middle school kids!) or RCIA. Some of the greatest minds in the Church joined the Dominican order: St. Albert the Great, his student St. Thomas Aquinas, Fra Angelica and more. 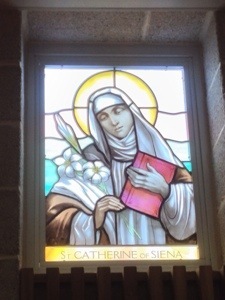 Saint Catherine of Siena, who is depicted in our own parish’s stained glass window, was a third order Dominican; she was largely responsible for convincing the pope to leave Avignon and return to Rome. Our brand-new chapter here in Salem is named for Bl. Pier Giorgio Frassati, a young man who grew up in the early 20th Century, and who was fun, gregarious, and had a deep love for the poor. He died at a young age from polio that was likely contracted while he was ministering to the sick. The number of people who showed up for his funeral astounded his agnostic family, who had no idea how often he had done without to sacrifice for the poor. 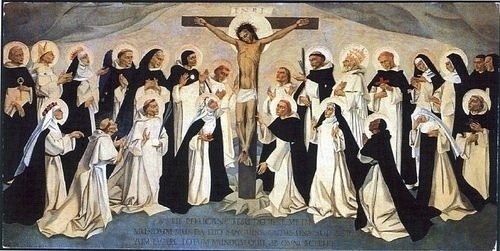 People become Dominicans for many reasons, but I’ll tell you just a little about why I am one. Oh, and that little dog in the dream? 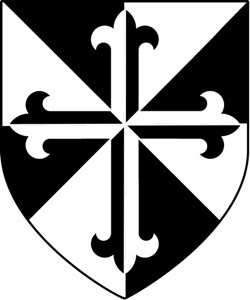 Well, the Order of Preachers became so well known for their tenacity and dedication to the Church and her teachings that they became known as “God’s Hounds” – Domini Cannes, in Latin. Saint Catherine of Siena once said, “If you are what you should be, you will set the world on fire.” It seems that God’s little dog with his torch, along with his Domini Cannes, did just that. This is an awesome entry on the Dominican Laity. I, myself am part of the Dominican Laity. Praying for the chapter. Thank you for the prayers! We feel quite a lot like those first friars that St. Dominic sent out: we don’t feel ready to do what we’re obviously being called to do. But we know we’re in God’s steady hands, and He will guide us and help us on our way. Yes, but amazing Friars but also Sisters. And the saint your group’s patron is a great choice.